The vast amount of data and information in analytics is enough to give anyone a headache. That's why many marketers are left wondering where to start, and how to report crucial information to stakeholders. By focusing on what truly matters for your organization, you can overcome many of the common challenges that marketers experience with analytics. Web analytics is powerful – it can help your teams make important marketing decisions, drive content strategy, and give senior-level management a glimpse at performance. And with great power comes great responsibility – meaning you want to make sure the right people have access, while still having control over the data. Many free analytics tools are cumbersome when it comes to assigning various websites or sections of a website to particular team members. So what’s a marketing team to do? The best way to combat this challenge is to keep your analytics organized and neat – remove any groups or websites that are no longer live, active, or relevant, and ensure each team member knows what they are responsible for. Meet on a regular basis to keep up with the team and make sure they are gathering the information they need on specific websites or areas of a website. Checking in and keeping each other accountable will help keep your team focused on what each person needs to accomplish. With our latest Analytics release, it is now easier than ever to assign team members to specific groups. You have the ability to assign group access only, which gives members access to their specific area of the website without giving them access to the whole site. The world of web analytics can be overwhelming to say the least. Where do you even begin to analyze information to make decisions? Many analytics tools offer advanced features, but advanced can mean complicated and require lots of training. Yet you still have to turn in a weekly report to your boss. Keep it simple and focus on the top three things you want to accomplish, rather than getting lost in all the data. For example, you could analyze the bounce rate on your top viewed web pages, and work on lowering the bounce rate by tweaking content, improving the design, or speeding up the page load time. Focus on whatever is going to make an impact on your end website goals. As you analyze and make progress on your website, you can always change priorities and what you want to focus on. Siteimprove’s recent behavior tracking update focuses on A to B user journeys in a user-friendly dashboard, where you can select the page you want to start on and end on to get an in-depth look at what your visitors do when they visit your site. Then you can make decisions about how relevant your content is, or how easy it is for your visitors to find the information they are looking for on your site by understanding the different routes they take. You want to track all the things because all the things matter. But do they? Every organization is different, the purpose of each website is different. Regardless of whether you want to drive more online sales, have visitors fill out a form, or click on a specific link, you need to track certain events and campaigns in order to fully understand how well your website is working to meet your goals. The problem and frustration with this is the amount of manual work that may be required to track the events or campaigns. While the time spent can be frustrating, there is very important information you can take away from tracking events. What to know what external links visitors are clicking on? Track the most popular external links and try to understand what additional resources or information your visitors want, then create content around that on your own site. Are you creating documents on topics that help your web visitors? Track how many times visitors download documents. There is something to be said for the importance of tracking the right events and utilizing the information strategically. With Siteimprove, the tracking is all in the CODE! Siteimprove Analytics automatically tracks clicks to external sites and documents. And with minimal set-up time on our end, you will be able to track clicks to videos, expandable menus, and much more. An easy peasy way of collecting valuable information! One of the most common challenges is actually tying the analytics data to measurable goals. Let’s say your organization wants to grow in revenue by 10% over the next year – somehow you need to create a digital strategy to help meet that goal, and use analytics to track how well the digital strategy is working. Unfortunately, this is going to be so unique for each organization, that there really isn’t a rule of thumb for how to successfully and easily use data to measure goals, but it is the most important thing you can do. At Siteimprove, we are passionate about helping organizations meet their web goals. With our Analytics, we offer unlimited training and support, meaning you have a team of knowledgeable Siteimprovers at your disposal! So there you have it, some ideas to help overcome the challenges in the world of web analytics! 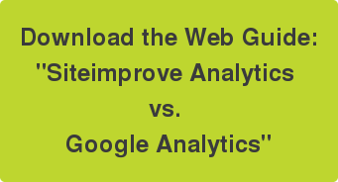 And if you’re curious to know more about Siteimprove Analytics, and how we compare to free tools, download the Siteimprove Analytics vs. Google Analytics web guide.